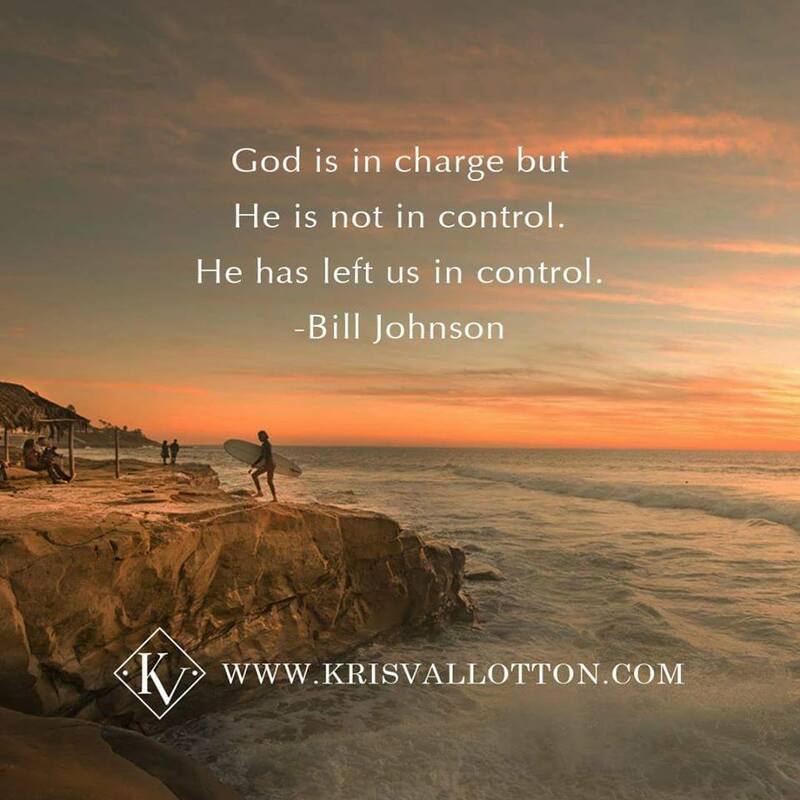 Bill Johnson, the leader of Bethel Church in Redding, California, claims that God has given complete power regarding what happens on Earth to man. Charismatics, like Johnson – especially those who teach Word-Faith theology, believe that they can exercise control over disease, sickness, and even weather. Bethel Church is the leading proponent of “teaching the miraculous” in the world. 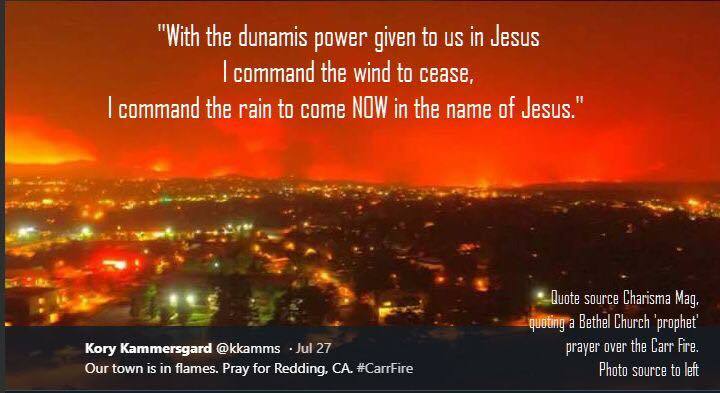 With the Carr fire consuming land near their headquarters and in their home county and outskirts of the city, Bethel leaders and members have been decreeing and declaring their power over the fire, calling down rain and demanding that wind stop. 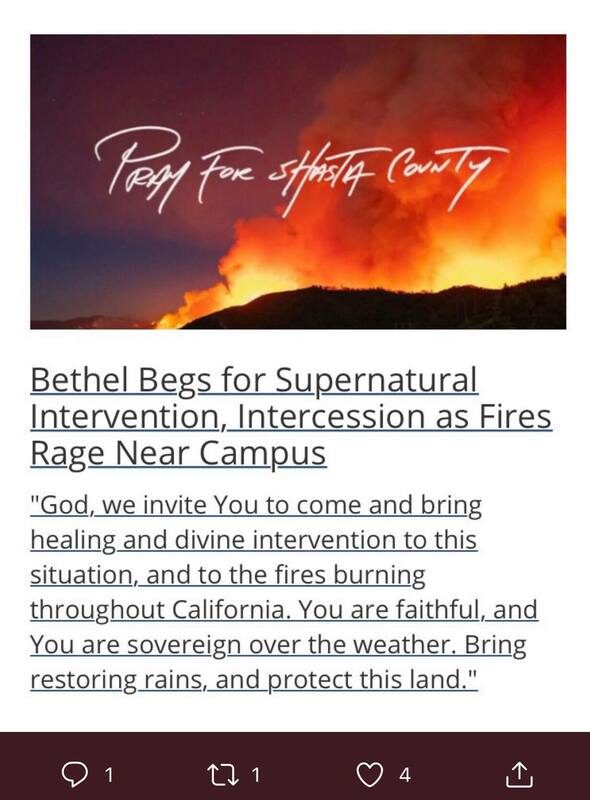 Unsurprisingly, their ability to control that which is controlled by God alone has proven futile, and 25 Bethel leaders have lost homes in the fire. The Bible likens prophets and supposed miracle-workers who claim to perform feats that they cannot and false teachers as being like “clouds without water,” an analogy that is fitting as Bethel pastors call down rain that doesn’t come. The proven track record of being incapable of performing miracles did not stop Bethel Church from crying out to the weather, like Jesus in places like Mark 4:35-41. The Internet has abounded with examples of misled charismatics feeling they control the weather. While we all should rightly understand that God both controls the weather and does answer prayers, it is different than individuals claiming authority over the wind and tempests under the assumption that they are little gods. The decrees and declarations have not worked. 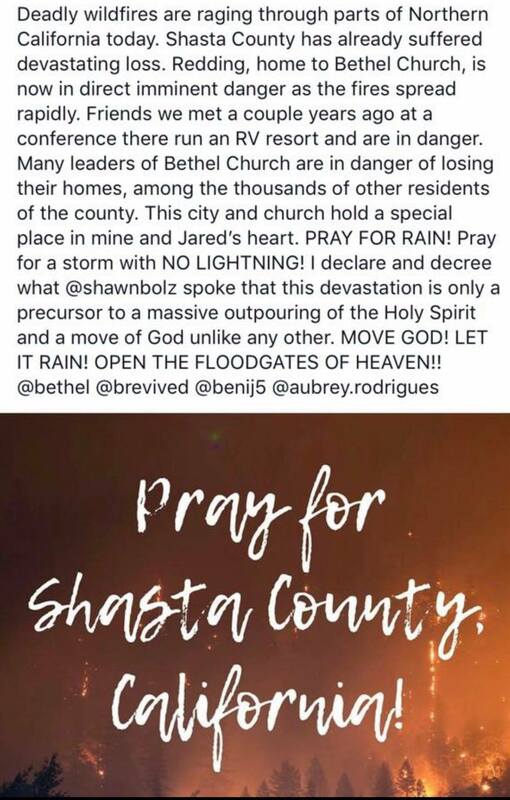 Charisma Mag reports that 25 Bethel Church staffers have lost their homes. They also report that the fire had the peculiar ability to jump over some homes without explanation and burn others, leaving some untouched and others torched. Clearly, God did not desire to save the homes of certain of those working for Bethel Church, in spite of the prophetic utterances commanding the fire to leave them untouched.